Sometime in the 4th grade, I thought it would be cool to bring my Tyco Hot Keyz to school for show and tell. Synthesizer strapped to my back, I proudly rode my bike to school that day with my best friend Andrea. I was the man. The Christmas I received my Tyco Hot Keyz was one of the best ever. 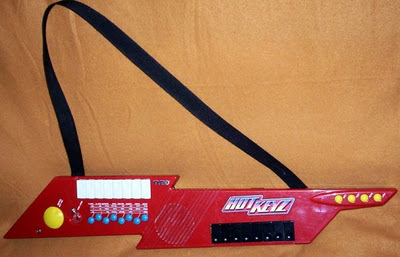 I remember my brother receiving a “guitar” that played noises when you pressed different buttons. Though I was a tad jealous of my brother’s gift (he always made things seem cooler than they were), I had been given a keytar! We rocked out that Christmas on my grandparents hearth (which was like a stage). I’m sure my parents must have hated those things. All hail the loud and annoying Christmas presents, they make children happy.